order a class set of 10 or more! The AP* European History Edition utilizes practice exercises that directly respond to the newly redesigned College Board recommended AP European History course outline. This edition was updated in 2017 to prepare students for the 2018 AP* European History exam. SOURCE-BASED MULTIPLE-CHOICE AND SHORT-ANSWER QUESTION EXERCISES! What’s the biggest challenge faced by your AP European History students this year? As they begin to master the content, you will find that writing clear, direct, persuasive essays is their biggest challenge—and the most important skill for them to master. Our biggest challenge, as teachers of AP European History, is trying to help them develop their essay writing skills without sacrificing valuable time needed for content instruction. That’s where Mastering the Essay comes in. 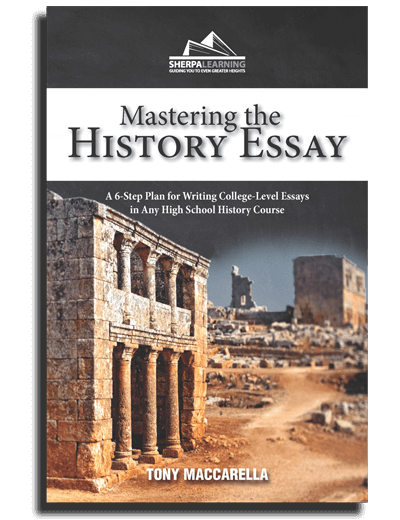 Mastering the Essay was designed to help students learn to write clear, direct, persuasive essays in the context of their AP European History course. That means, as their teacher, you can teach writing skills AND content within the same class period. Impossible, you say? Check out the table of contents in the downloadable sample. No matter what content you happen to be teaching, Mastering the Essay has a writing exercise for your students—regardless of their current skill-level. Mastering the Essay aims to change the way we teach writing skills within our AP European History classes, and Sherpa Learning aims to change how educational resources are developed. We want to provide resources that help you to help your students without adding more hours to your already overloaded work schedule, AND we want those resources to reflect your needs by involving you at every step along the way. Join our team to help us develop and test exciting, new content!